For the Dough: Dissolve yeast in water and set aside for 5 to 10 min.. Be sure that water is not too hot: Temps over 120 will kill the yeast. IF USING UPRIGHT ELECTRIC MIXER: Use mixing paddle attachment because batch size is too small for the dough hook. Combine all other ingredients. Add dissolved yeast. Use the lowest 2 speeds to mix dough. Mix 2-3 min. until dough is smooth and elastic. Over mixing will produce tough, rubbery dough, and friction will cause dough to rise too fast. IF USING USING FOOD PROCESSOR: Use dough blade.proceed as in preceeding instructions. IF MIXING BY HAND: Place dry ingredients in a 4-6 qt mixing bowl , make a well in the middle and add liquids. Use a wooden spoon to combine. Lightly oil hands and knead for 5 minutes. When done the dough should be slightly tacky. Lightly oil the ball and the interior of a 1 qt. glass bowl. Place dough ball in bowl and seal bowl air-tight with clear food wrap. Set aside at room temperature to rise until double in bulk: 1-1/2 - 2 hrs. The dough could be used now but it would be nothing special To obtain that wonderful, chewy, flavorful dough that it will later become, punch down dough, reform a nice round ball and return it to same bowl; cover again with clear plastic wrap. Place bowl in refrigerator overnight, covered airtight. About 2 hours before you are ready to assemble pizza, remove dough from fridge, use a sharp knife to divde dough into 2 equal portions. Roll smaller dough into round balls on a smoothe surface; seal any holes by pinching . Place the dough balls in a glass casserole dish, space far enough to allow each to rise until doubled in size (about 2 hrs.). They should be smooth and puffy. To stretch and form dough for pizza, sprinkle flour on smooth surface. Use a spatula to carefully remove dough ball from casserol dish . Be very careful to preserve its round shape. Flour the dough liberally. Use your hand or rolling pin to press dough down forming a flat circle about 1/2" thick. Pinch dough between your fingers around edge forming a 1/4" rim. Continue this outward stretching until you have reaached a 9" diameter pizza dough. Yields ennough dough for 2- 9" pizzas. After topping pizza transfer to pizza stone in preheated oven. The stone should be preheated at 500 degrees for 1 hour. Bake 8 to 10 min. California Club Pizza Topping: Cook chicken on grill 2 minutes on first side. Turn and cook 1 minute on second side. Dice into 1/2 inch pieces. Mix iceberg lettuce and romaine lettuce together in large bowl with 4 tablespoons mayonnaise. Mix until lettuce is well coated with mayonnaise. When pizza is baked remove from oven, cover top of each pizza with 1/2 the lettuce mixture. Slice each pizza into 8 pieces. 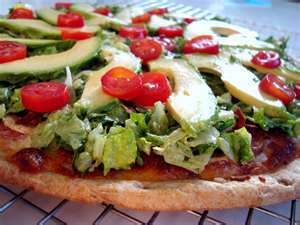 Top each slice with 1 slice tomato and one slice avocado.